I have been thinking about reading aloud of late, particularly as last year, I shared the odd poem from Allie Esiri’s A Poem for Every Night of the Year with my boyfriend. Prior to this, I had done very little reading aloud since leaving my taught University classes, and realised that it is something I really miss. With that in mind, I thought it would be a nice idea to curate a list of some of the books which I have most enjoyed reading aloud in the past. Given the nature of this list, they are almost all children’s books, as I did most of my reading aloud in groups whilst in junior school. Regardless, picking one up and reading it aloud is sure to charm any child, or to make you feel very nostalgic indeed. Which is your favourite book or poem to read aloud? I have read an awful lot of novels about aspects of Woolf’s life, as well as many biographies. I have scoured library shelves, and thought that I’d made a real dent in reading reflections upon and criticisms about her work. It seems that I was misled in this however, as whilst researching before Christmas, I came across an awful lot of wonderful looking tomes which view Woolf’s life in different ways, and from different angles. Some are critical, and others not so much. I thought that I would group these together in a single post, as a wishlist of sorts, as well as a resource for those I know also admire Woolf and her work. Which are your favourite books about Woolf? Have you read any of these? Norah Vincent’s Adeline: A Novel of Virginia Woolf is, in simplified terms, a fictionalised biography of one of the twentieth century’s most enduring authors. Adeline, named as she was after her mother Julia’s deceased sister, was Woolf’s given name. It was never used within her family, ‘as Julia did not like to use the name full of painful association’. The structure of Adeline is fitting; Vincent has chosen to split the story into separate ‘Acts’, all of which correspond to Woolf’s own publications; one is entitled ‘Night and Day’, for example, and another ‘The Voyage Out’. The novel begins on June the 13th 1925, and ends with Woolf’s suicide on the 28th of March 1941. Throughout, Woolf’s thoughts – all of which have been influenced by her diaries and letters – have been woven into various plotlines from her novels. Vincent is marvellous at demonstrating in this manner how inspiration strikes. 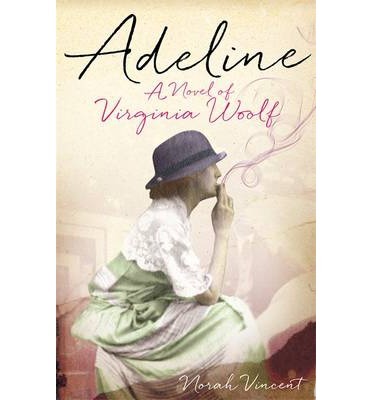 In Adeline, Woolf comes to life immediately, and the novel’s opening scene is particularly vivid: ‘She is lying full down in the bath, with the tepid water hooding her head and lapping just below the vaulted arches of her nostrils… She can hear her heart galloping distantly, as it so often does when she is ill, thrumming weakly but so quickly, a soft insistence sucking at the drums of her ears’. Vincent goes on to describe the way in which, ‘as if startled by the sound of her own voice, she sits upright with a great sloshing urgency, her buttocks squeaking on the porcelain, her knees bucking, legs tensing straight and splashing’. Vincent is so in control of Woolf’s dual personality; one gets the impression that she comprehends it, and its implications, perfectly: ‘There is the stall of recognition. She knows this feeling, this progression of decline, she knows it very well, the consciousness curling under the despair, helpless as a page in the fire, succumbing to the grey, darkening possession’. In Adeline, Woolf and her genius have essentially been placed upon a pedestal, from where they are examined. Vincent has included some well developed conversations, and has built the plot around Woolf’s relationships with others, from her siblings and husband Leonard, to her affair with Vita Sackville-West. Famous characters from the Bloomsbury Group have been considered too, from biographer Lytton Strachey to poet T.S. Eliot. Adeline has been meticulously researched, and its prose is both beautiful and intelligent. The turns of phrase are deftly created: ‘The world seemed to be speeding up and slowing down, going liquid and solid at the same time, and me with it’. The literary techniques which Vincent has used – Woolf talking to her child self, for example – work so well, as does the way in which the story follows both Virginia and Leonard. The Bloomsbury Group, intrinsic as it was in the lives of the Woolfs, has been considered too: ‘Their life, their bond, their work and their circle of closely kept friends are about one thing: maintenance of the necessary illusion’. So many ideas can be found within the story, and one really gets a feel for Woolf’s world. The only thing which let the novel down for me are the Americanisms which sometimes creep into the text. The use of the word ‘gotten’ is rather jarring, and its historical inaccuracy with relation to England during the 1920s and 1930s pulls the novel from its otherwise excellent historical grounding. Adeline is a must-read for any fans of Woolf, or those with interest in the wider circle of the Bloomsbury Group, providing as it does a stunning and interesting portrayal of an author whose life and legacy still fascinate to this day. Vita Sackville-West was a prolific author indeed, writing fiction (novels and short stories), poetry, biographical works, travel literature, and a column on gardening, amongst other things. Vita Sackville-West’s Pepita, a biography which portrays the lives of both her grandmother, Josefa, whom she never met, and her mother Victoria, was first published by Leonard and Virginia Woolf’s The Hogarth Press in 1937. The edition which I read was sadly not an original, but it did include rather a lovely introduction written by Alison Hennegan. Josefa, lovingly known as Pepita to those around her, was ‘the half-gypsy daughter of an old-clothes pedlar from Malaga’, who made her fortune as a dancer, first in Madrid, and then as the ‘toast of all Europe’. In May 1852, when she was just twenty-two years old, she arrived in London, already having been married and separated. She soon met and became the ‘contented though severely ostracized mistress of Lionel Sackville-West, an English aristocrat and diplomat’. and bore him five illegitimate children, of whom Sackville-West’s mother was the second eldest. After Pepita’s death, her nine-year-old daughter Victoria was sent to live in a convent, where she stayed until she was eighteen. At this juncture, she was summoned to Washington to become ‘mistress’ of her diplomat father’s household. She goes on to find herself ‘the volatile and wayward mistress of Knole’ in what is termed in Pepita‘s blurb as an ‘unlikely inheritance’. In her introduction, Hennegan states: ‘For what appears to be a straightforward joint biography of her grandmother and mother becomes the means whereby Vita explores and makes sense for herself of those warring elements in her own past and temperament which most exercised and perplexed her.’ She goes on to say that for Vita, it was her ‘”Spanishness” which enabled her to accept her lesbianism comparatively easily, her “Englishness” which forbade anything as “vulgar” as a public acknowledgement of it.’ Sackville-West herself saw Pepita as a ‘gift to herself of the mother she almost had… [and] an extended love letter to the woman she wanted her mother to be.’ She writes: ‘Pepita, can I re-create you? Come to me. Make yourself alive again. Vitality such as yours cannot perish. I know so much about you: I have talked to old men who knew you, and they have all told me the same legend of your beauty’ of the section on her grandmother. She extends this rule of exploration, and the hearsay she has been told, when she writes about, and tries to understand, her mother. What I found most interesting about this account was the effect which Pepita had upon Lionel. Sackville-West writes: ‘I mean no disrespect to my grandfather, but I do not think he was the man ever to enjoy dealing with a difficult situation: he far preferred to go away if he decently could and leave it to somebody else. Hitherto, Pepita had ordered his life, and now [after her death] there was to be an uncomfortable period of transition until Pepita’s eldest daughter was of an age to assume the same responsibility.’ The psychological effects of the First World War which Sackville-West presents are also fascinating. There is a lot of Vita herself within the book, and not just in the fact that she is writing about her ancestry. She measures herself against her mother and grandmother at junctures, and is always passing her own opinion about their characters, or the decisions which they made. Of course she has a strong connection with both of her subjects, but there is nothing objective about this biography; there is not the level of detachment and feeling of truthfulness which I expect of works of this kind. Sackville-West does not remove her own self from the book enough for it to be anything like a full and far-reaching biography. Pepita is a relatively entertaining book, but I feel as though it pales in comparison to much of Sackville-West’s other work. It is difficult to take Pepita at face value, and it lacks that engagement which I have come to expect from Sackville-West’s books. It is clear that her relationship with her mother was turbulent, but it feels at times as though episodes have been suppressed, or skimmed over. There is no real explanation as to their relationship which lasts long enough to be entirely satisfying. Overall, Pepita did not quite live up to my expectations. 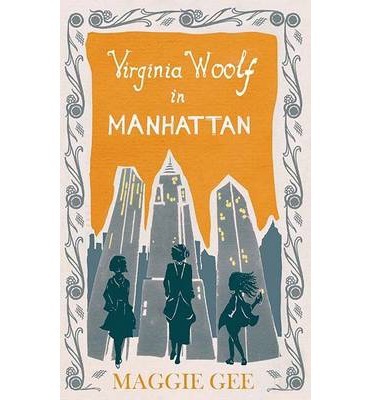 Championed by bestselling authors such as Jacqueline Wilson and Patrick Ness, Maggie Gee’s Virginia Woolf in Manhattan was first published in 2014, to great acclaim. The Virginia Woolf Society of Great Britain, for instance, term it ‘a remarkable feat’ and ‘an exhilarating novel’. The premise which Gee has focused upon is most inventive: ‘What if Virginia Woolf came back to life in the twenty-first century?’ Rather than simply muse upon this idea, Gee has fashioned quite an original story around it. A mid-life crisis has befallen her protagonist, bestselling author Angela Lamb. After her ‘irrepressible’ daughter Gerda has been left at her boarding school, Angela decides to take an impromptu flight to New York in order to ‘pursue her passion for Woolf, whose manuscripts are held in a private collection’. The following twist ensues: ‘When a bedraggled Virginia Woolf materialises among the bookshelves and is promptly evicted, Angela, stunned, rushes after her on to the streets of Manhattan.’ She soon becomes the chaperone of the novel’s ‘troublesome heroine’, as she tries to adjust to life in the modern – and rather bewildering – world. The novel begins in an engaging manner, the tone, strong prose and wit of which is sustained throughout: ‘There is thunder as Angela flies to New York with Virginia Woolf in her handbag, lightning crackling off the wings of the plane’. In Virginia Woolf in Manhattan, Gee writes intelligently. It is clear to see that she is very practiced at her craft, and is comfortable with being playful in both her choices of vocabulary and turns of phrase. The whole of Virginia Woolf in Manhattan has a marvellously contemporary feel to it; there are no constraints in terms of the text existing in strict, conformist paragraphs. I was reminded of Ali Smith at times, with regard to the thought which had clearly been given to the visualisation of the text. The narrative, too, has been well-handled. Portions are told from the imagined voices of both Woolf and Angela, and these alternate with the omniscient third person perspective, which gives a wonderful overview. Virginia Woolf in Manhattan is facetious, creative, and brimming with a plethora of thought-provoking scenes. It is the first of Gee’s books which I have read, but I can safely say that it certainly will not be the last.